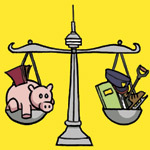 Mayor Ford maintains that his administration can find ways to scale back spending without compromising city services. 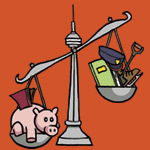 In this ongoing series, we consider whether these suggestions will help balance the budget, and also balance fiscal restraint with Torontonians’ service needs. 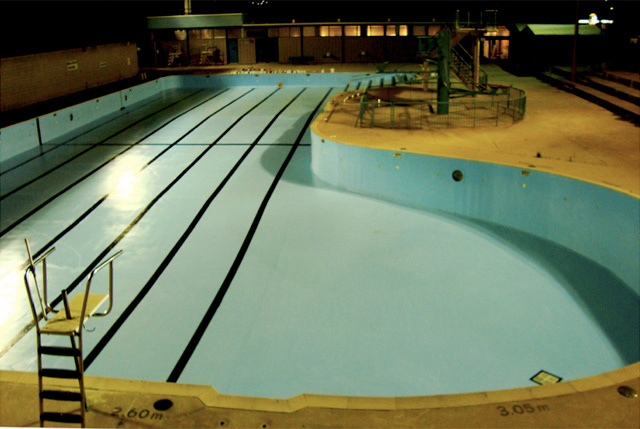 The Joseph J. Piccininni swimming pool. Photo by Rob Elliott from the Torontoist Flickr Pool. Raising user fees for public services is a common tactic to balance the city’s budget—and a common tactic for raising revenue but not taxes. User fees make up 16% of Toronto’s operating budget, and so raising the rates, even slightly, can generate significant revenue. While these fees include the cost of renting city property, obtaining a marriage licence, and hiring emergency medical professionals, most of the fees cover programs at community centres under the Parks, Forestry & Recreation department. It’s that last category we’re looking at here. Raise user fees at community centres by an average of 3%, and cut free adult programming at designated “priority centres,” to increase operating budget revenues. The budget includes forty-five pages of changes in user fees. The bottom line is that the cost of community centre programs are going up for most people [PDF]. (Warning: this is a confusing document. While it looks like lawn bowling is going to be free, it is actually going to cost $3,000 under a “harmonized” fee.) These increases apply to programs such as swimming lessons, summer camps, fitness and sports programs, and dance classes. Most fees would increase by 3%—in real dollars, this means the cost of classes would go up by $1 to $5, and the cost of camps would increase by $5 to $10. Such small increases alone would likely not prevent many people from enrolling in these classes, but this is the second time in as many years that Toronto has increased fees for recreation programs. In 2010, the City projected a gain of $9.2 million by imposing new $15 fees for children’s programs and a $2 drop-in swimming fee [PDF]. The 2010 budget also projected a gain of $7.1 million from small increases to recreation programs similar to those proposed in the 2011 budget [PDF]. The cumulative effect is that an Ultra 1 swim class that cost $52.98 in 2009 would, according to current proposals, cost $63.86 in 2011. For parents and older adults who access community centres often, these small increases add up to a significant expense. But the biggest hit will come to those who attend programs at priority centres: twenty-one community centres and pools around the city that offer their programming for free. Eight of these centres are located in one of Toronto’s priority neighbourhoods. Adults would have to start paying for programs at priority centres under the 2011 budget, at an average cost of $68 per nine-week class. Those who can’t afford to pay may still qualify for free programming under the City’s Welcome Policy. The Welcome Policy is a great thing—it allows people who are below the Low-Income Cut-Off [PDF] to access community centre programs for free. It has gone from serving thirty thousand people in 2008 to a projected ninety thousand in 2011. To accommodate this increase, the City has proposed an increase of $645,000 in funding, calling the Welcome Policy the “preferred model to ensure access to programs” [PDF]. The Welcome Policy is currently course based: it limits adult participants to one course per season. The City has proposed changing this in 2011, maintaining that it is unfair to allow a person to enrol in any program regardless of how much the program actually costs. This apparently means “recreation resources are not allocated equitably” and so the Welcome Policy may be converted from a course-based allocation to a dollar-based allocation [PDF]. Setting this dollar limit is going to be tricky—if it’s set too low some programs will become entirely unavailable to Welcome Policy users. If the City reforms the Welcome Policy to a dollar-limit allocation, adults living close to priority centres could go from being able to freely enrol in any course all year to having to shop for the cheapest course per season and take only that. Cutting free adult programming at priority centres will save the city $200,000. Raising user fees at Parks, Forestry & Recreation will earn the city $759,519. The increases to user fees are unfortunate, but balanced. They are equal across the board, and do not discriminate against certain programs. They are only small increases—most of the bigger jumps in user fees already occurred in 2010. While it is difficult to justify even a marginal increase for the low-income people who use community centres, user fees still only cover a fraction of the actual cost of operating these centres. However, if user fee increases become a default pool of funding to balance the budget in the future, then we will start to really worry. Cutting free adult programming at priority centres is not a balanced move. With only $200,000 to gain, it doesn’t make sense to end this remarkable benefit for communities that need a place to learn, exercise, and gather in a comfortable, safe environment. The Welcome Policy is not a replacement subsidy: it is meant for the city as a whole, and is not targeted to specific communities that need support. The most marginalized people will be squeezed out if free programming isn’t continued, and those who have come to rely on these programs will suddenly find their options limited.